In honor of Valentine’s Day’s feelings of love, roses, and kisses, the Austin dental office of 12 Oaks Dental thinks it’s important to cover the pros and cons of kissing. Before you partake in any lip to lip action, take a moment to read up on how kissing is bad – and good – for your oral health. Taking kissing advice from your dentist in Austin can seem a bit odd. But we are the experts in all things related to your mouth, so there’s really nobody better! Everybody kisses. It’s natural and it’s good for showing your love and devotion to your partner. However, there are a few dangers that you should be aware of before smooching. In fact, according to the Academy of General Dentistry (AGD), one kiss can share more than 500 types of disease-causing germs and viruses including cold sores, Mononucleosis (Mono, or the kissing disease), and even gum disease. And as we all know, kissing can also lead to sharing of a cold or the flu. But don’t ban kissing just yet. There are actually upsides to locking lips with a loved one. Kissing can benefit your oral health by increasing saliva production. Saliva helps wash away food particles and cavity-causing bacteria, and can also protect teeth from decay by neutralizing acids. Additionally, kissing can enhance your mood and strengthen your relationship. So smooch on! Just be careful of any possible oral health dangers. The best advice from our Austin dental office is to make sure to keep up with your professional cleanings and checkups to limit the chance of sharing dangerous germs or even gum disease with a loved one. If you’re due for a checkup, or if you want to get kissable, fresh breath for all those romantic moments, call 12 Oaks Dental to set up an appointment today! 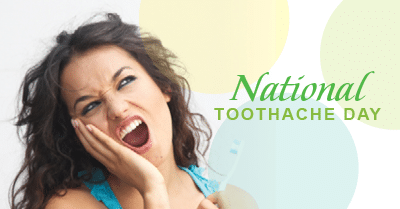 Every year on February 9th, we celebrate National Toothache Day. A holiday devoted to toothaches? We think it’s a bit odd too. But that doesn’t mean we aren’t going to commemorate it! At the 12 Oaks Dental office in Austin, we want this year’s National Toothache Day to bring out the best in your smile and help you avoid toothaches in the first place. Toothaches are painful and unpleasant. Simply put, they’re really just no fun. However, they can be avoided with good oral hygiene and a proactive dental health approach. At 12 Oaks Dental, we always encourage our patients to brush properly twice a day, floss at least once a day, and of course, to come visit us regularly for professional cleanings and checkups. Maintaining a good at home care routine and a regular oral hygiene schedule with your dentist in Austin not only can help prevent toothaches, it can help protect your teeth for life. Often times, toothaches are your mouth’s way of telling you, “Hey! Something’s not right in here!” and that makes it really important for you to call 12 Oaks Dental immediately. If you happen to be suffering from a toothache in Austin, we encourage you to take action and call us as soon as possible. We’ll perform an in depth examination to determine the cause of your pain and work with you to get you toothache-free and feeling better.